This article, written by Patrisse Cullors and Rodney Diverlus, appeared on the Guardian Australia on Wednesday 1 November. Of the many remarkable moments on our Australian trip so far, there’s one that stands out. After playing the didgeridoo, Nathan Scott stood up, opened up his notebook and read out his father’s story. He was only six months old when his father Douglas Scott was found hanged in his cell in Berrimah prison in Darwin. The family was told he had killed himself, but Nathan’s mother refused to believe this. For 20 years, his mother fought for justice for his father, but she never found it. The police harassed and surveilled the family when they asked questions, but there were no answers. And yet, although the family never received justice and it was a great sacrifice for everyone involved, Nathan Scott said he wouldn’t have done anything differently. For him, his fight for his father was a fight for all Indigenous Australian people. As a co-founder of Black Lives Matter, this was powerful because people often say to us, it’s been four years and police are still killing black people, do you think your movement has failed? My answer is always the same: this has just begun. There is a long road to undo colonialism and racism. It is going to be a long road to achieve the things that we want but it doesn’t mean you stop, it doesn’t mean you give up. When we started Black Lives Matter, we understood that this movement wasn’t just for the United States but one that could centre black communities around the globe. We don’t see this as a civil rights movement, we don’t see this as relegated to the United States but as a human rights movement which allows us to have a broader conversation about anti-black racism across the globe. So we have travelled to the UK, through the Americas, to Palestine and now to Australia. Throughout our travels we have seen that black people and Indigenous people are suffering, and, despite that suffering, local governments aren’t standing up for us. Wherever black people are, there is racism and the impacts of racism. Yet wherever black people are, there is resistance. We are still resisting and we are still calling for new ways of relating to us, we’re still calling for care and for dignity. Black Lives Matter is in Australia to accept the Sydney peace prize, and meet with black Australians. 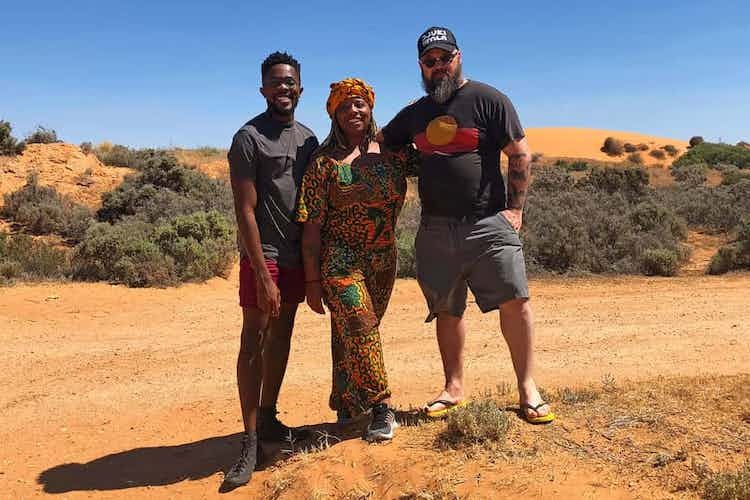 During our trip, the thing that stands out to us most is that Indigenous Australians are facing some of the most horrendous living conditions in the world, sadly similar conditions to those in the US and Canada. Black Lives Matter is pertinent here in Australia and as we have conversations with people, we are realising that. We have heard about the high incarceration rate of Indigenous people and Torres Strait Islanders. We have heard about the impact that colonialism has had on the family unit and how this has contributed to family violence. We’ve heard about the deaths in custody, and the families who have lost their children held in custody. Many of these family members are calling these murders, because when they are finally able to see their children, they were bruised and battered, with broken bones. Local government must hold law enforcement accountable for these atrocities. The government can no longer be silent, it must stand on the side of the original people of this land, and challenge the idea that their lives don’t matter. In the long term, the only way to change the living conditions of Indigenous communities is through divestment – and then reinvestment. Over the years, local governments have completely divested from caring for our communities, so we are calling for a reinvestment in black and Indigenous communities. We’re calling for divestment from resourcing agencies and local public agencies that cause harm and violence to our communities. What makes our communities safe is for us to have access to healthy food, to feed our communities, to access jobs, and to be able to access public education. This can be achieved through reinvestment in Indigenous communities. This is a long term struggle against racism. We stand on the shoulders of giants, of black leaders from across the globe, who have put their lives on the line to fight for not just the survival of black people but the thriving of black people. We see our work as part of a much needed resurgence of a human rights movements in our country, in the US, but also abroad. We are not the first ones to do this, we know we are not going to be the last, we are part of a legacy of freedom fighters. And while there is heartbreak, there is also hope. I am never numb to the impact racism has on my communities across the world. As I listened to the families that shared their stories on Tuesday at the Redfern community centre, I cried because that could be my family, that has been my family, and so my heart is with the Indigenous people of Australia. But there is a growing desire for a broad base movement for Indigenous communities across the country. There is a desire to have a conversation in Australia that doesn’t end with talking but that really catapults a new practice in how this country relates to its original people. That is really inspiring. It’s inspiring to talk about how we’ve changed the landscape for our communities in the US and in Canada, and what might be possible here in this country. And this gives me hope. The Black Lives Matter Global Network is in Australia to receive the Sydney Peace Prize. They will be awarded the prize at the City of Sydney Peace Prize Lecture on 2 November and appear In Conversation in Melbourne on 4 November.